I love using tahini in salad dressings. It's so easy to whisk it with a few other ingredients and create a wonderful creamy dressing. In this recipe I mix it with some miso for a great savory punch. The lemon juice brightens up the flavor and saves the dressing from tasting too much like gravy. I love gravy, but not on my salad please. This dressing works well with leafy greens. I used massaged kale this time, but arugula, spinach, mâche or escarole/endive tastes great too. To make it filling meal salad it needs some protein. In the picture I used the tempeh from this recipe, but below I have instructions for a very easy and delicious baked tofu. If you make the tofu in advance, the salad comes together very quickly. Baking is one of my favorite ways to prepare tofu. It's so easy and the flavors are really 'baked in' so the tofu becomes very flavorful without having to marinade for a long time. The tofu dries out a bit in the oven, which gives is a nice chewy bite. Baked tofu keeps for about five days in the fridge, so it's a perfect meal prep candidate. Make a big batch at the beginning of the week and you have a tasty protein ready to go for multiple meals. Preheat the oven to 220 C/ 425 F.
Cut the block of tofu into 1 cm / 1/2 inch thick slabs. Put the tofu on a clean tea towel and cover with another towel. Press down on the towels with your hands or a cutting board to squeeze out excess moisture from the tofu. Cut the pressed tofu into cubes. Put the cubes into a casserole dish and mix them with the soy sauce, oil and garlic. Spread them out and put the dish into the oven. Bake the tofu for about 45 minutes. Toss the cubes two or three times with a spatula during the baking process. The tofu is done when the cubes are firm and brown. Allow them to cool while you make the salad. 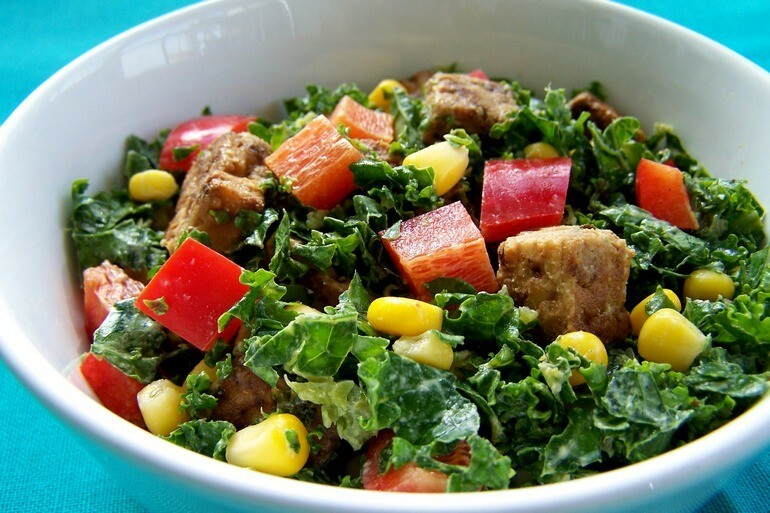 Put the kale into a bowl and 'knead' it with your hands so it becomes tender. If you are using other greens than kale you can skip this step. In a small bowl, mix the tahini, miso and lemon juice. It will become a thick paste which you can gradually thin with water until it has a nice creamy dressing consistency. Taste the dressing and add a bit of sweetener if you like. Pour the dressing over the kale and mix well. Add the corn, pepper, pumpkin seeds and tofu and give everything a good toss. Divide over two bowls or deep plates and serve.